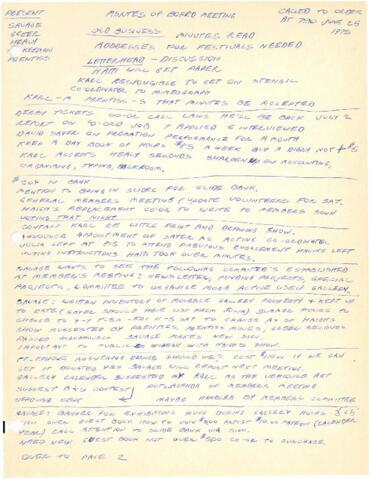 Item consists of a handwritten document of minutes from a board meeting held on June 26, 1975 at Eye Level Gallery. Item appears be repeat same information in MS-3-35, Box 18, Folder 10, Item 22, but in an edited and presentable version. Handwritten minutes on acidic paper. See MS-3-35, Box 18, Folder 10, Item 22 for the same set of minutes taken at the meeting.